Use segments within a list to create filters and use them in a targeted manner. This makes it possible to, e. g., filter customers of a certain category or area. The only condition is that the informtation you want to filter exists in the recipient details. To create a segment, click on [Segments] within the recipient list. Create a new segment and determine the respective conditions. With the drop down menu [Recipients must] you can specify if your conditions are inclusive (AND) or exclusive (OR). E.g. if you select [one condition], recipients must only match this one criterion to be included in the segment. If you select [all conditions] all criteria must be met. If you only enter one condition for a segment, this selection has no impact. The switch [Basic] lets you expand the segment functionality to choose between AND respectively OR connections of the single conditions. You can segment recipients based on their activity within previously sent emails (FollowUp segment). As long as the Privacy function is deactivated (see [My Account] > [Settings] > [Privacy]) you can e.g. segment all recipients who have opened a specific mailing. 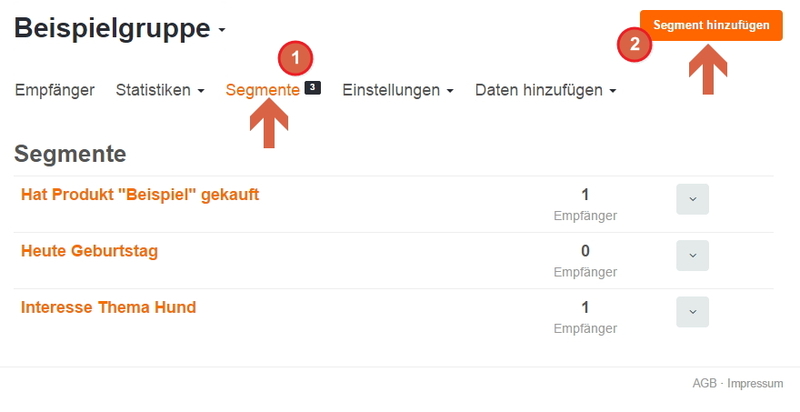 Now you can use a segment as target group for an email campaign or export the data within the segment. The segments are dynamic which means that should the data within a segment change, this will affect the actual segment. Segments can also be used for automated birthday emails. Find more information here.